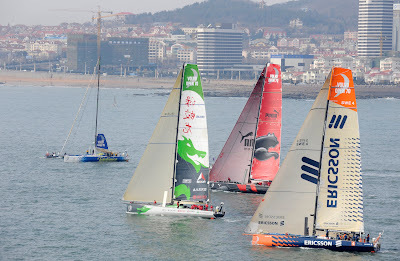 Photo: Rick Tomlinson/Volvo Ocean Race. The fleet departed from Qingdao at 1300 (0500 GMT) for the longest leg in the history of the race, that will see the fleet sail one third way around the world in order to secure valuable points. Before the fleet departed, the dockside and sea front was crowded, as over 900 drummers bid farewell to the crews. Crew by crew, the sailors walked the huge model of the Great Wall of China, striding across the last stretches of land before stepping on a boat for up to 40 days. The skippers, like in the arrival ceremonies, were dressed in cloaks and helmets, axes in hands. Conditions were light and visibility was good as the sun broke through on the race course. All four boats headed to the start however Telefonica Blue quickly dropped their mainsail and headed back towards port. They were forced to return to the dock after sustaining keel damage after encountering a shallow patch of water off Qingdao harbour.